Wheat and gluten free made from 100% organic brown rice. Brown rice retains many health-giving nutrients because it is less processed and contains significant amounts of fiber, B vitamins and minerals such as selenium and magnesium. 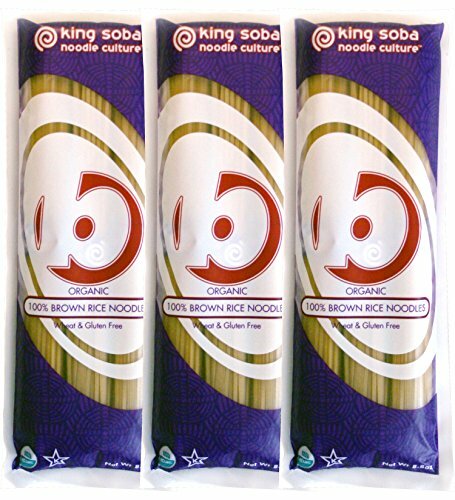 King Soba products are gluten free, wheat free, Kosher and suitable for Vegetarians, Vegans and Celiacs. Our noodles are carefully sourced and certified according to organic standards, and processed in a dedicated wheat-free factory. Accept no substitute! Quick cooking in 3 minutes! If you have any questions about this product by King Soba, contact us by completing and submitting the form below. If you are looking for a specif part number, please include it with your message. Maurizio - Italian Spaghetti Alla Chitarra, (4)- 17.6 oz. Pkgs.